Unlike del Toro who directed acclaimed films like “Pan’s Labyrinth” and “Hellboy 2: The Golden Army,” DeKnight is making his feature film debut here after directing multiple episodes of “Spartacus” for Showtime. It becomes very clear pretty darn fast that not only is he NO del Toro, but he was ill-equipped to handle something so massive in the first place. See, I give a lot of shade to giant robot movies because they are usually not very interesting, have little to say, and tend to have too much happening on screen without a whole lot of it registering. But the genre is, at it’s core, a lot of fun when things come together. 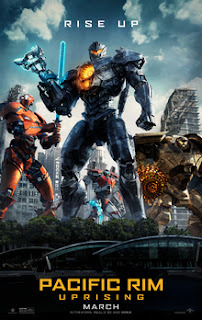 They usually come together because said movie isn’t taking itself too seriously, but in the case of “Pacific Rim” it came together because a visionary was behind the camera, understood how enjoyable the concept could be, and was able to deliver it to his audience in a way they could appreciate it as well. I can’t say that is going to be the case here. I suspect this is going to be a very costly mistake for the studios involved, as the movie is clunky, fails to engage the audience, and even goes a step further in proving its uselessness by largely disposing of characters from the previous films in favor of new (less interesting) ones. The major newcomer is Jake Pentecost (John Boyega, who also shares a producer credit), who is the long-lost brother of Mako Mori (Rinko Kikuchi). He is one of those “scavengers” you see in movies where good guys are short on quality pilots, as he searches for valuable junk on the street that he wants to sell for a profit. He’s one of those guys who COULD be an asset in the world’s war against alien monsters, but he would much rather get into insult wars with teenage girls (Cailee Spaeny) on the street. He’s not a terrible character (unlike the aforementioned girl), but he is rather boring in comparison to the leads in the first movie. Those characters weren’t deep with their motives, but they had depth in their personalities, and their fighting styles reveled more about them than anything the script had them say. In fact, it was during the fight sequences where del Toro put his personal stamp on the first film, managing to convey character development through action sequences that would otherwise have been very basic…like in this movie. What will likely disappoint fans of the first film who see this one is how is doesn’t feel any different from “Kong: Skull Island” or any of the dozen Transformer movies that exist. We went from having a unique, stylish action film to something far more generic and boring. And really, it must stop at some point. Hollywood keeps complaining that movies are making less money and attendance is low, but what do they expect when they pour more than $200 million dollars into something that would be more fun if someone played it as a video game? I’m not saying del Toro could have saved this movie with any certainty. Maybe going down this path once was really the only way we could have won, as the first movie pushed its luck as it was. Yeah, it worked once, but having seen “The Shape of Water” reminds me that I would rather have artists making truly artful films, rather than whiz-bang action spectacles that assault the senses so much you become brain dead to them after they are done. Heck, the only reason I’m speaking so highly of the first movie in the first place is because the second is so basic in comparison. I suppose that means on its own, “Pacific Rim Uprising” is a bug you step on, stop for a second to scrap it off your shoe, before moving on with your life never to think about it again. Parents, there is the usual amount of monster violence and PG-13 friendly curse words. Recommended for ages 14 and up.